An alien dog! A mad scientist! A universe of trouble! That’s what you get when you send a (sort-of) average human kid to middle school – in space! 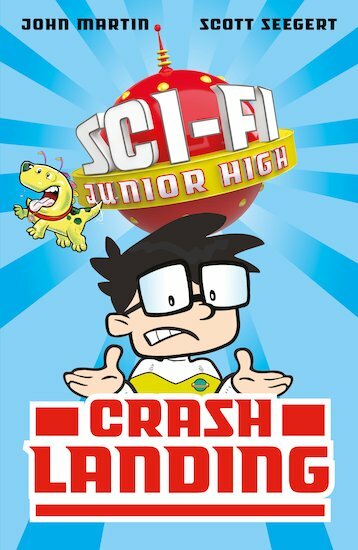 Kelvin is the new kid at Sci-Fi Junior High, a floating space station filled with alien kids. For better or worse, he’s arrived just in time for the annual school dance: the Galactic Get Down. Kelvin is desperate to take the luminous Luna, whose species literally glows. But since being caught out in his whopping lie about being a Mega Super Genius, Kelvin doesn’t stand a chance. What he needs is a way to become super-cool, so that everyone forgets his shaming fib. And Kelvin might just get that chance when mad scientist Erik Failenheimer escapes from prison, kicking off a battle to save Sci-Fi Junior High from imminent doom. Let’s dance!